Enter your prescription... you can find this on your box. All fields need to be filled out. If you are only ordering for 1 eye, set the quantity for the other eye to zero. "Thank you so much. I am very happy with the service and will use your service again. " The Biofinity Toric 6 pack features the most advanced ocular solutions available under the BIOFINITY brand, one of several globally recognised brands. Biofinity Toric lenses are manufactured out of silicone hydrogel and can be used by patients diagnosed with different stages of astigmatism. The comfort and efficiency of its design has led to the pack becoming a popular favorite among eye care practitioners. 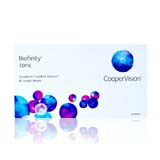 BIOFINITY Toric lenses are manufactured by Coopervision, a subsidiary of The Cooper Companies. Coopervision is considered to be the 3rd largest manufacturers of contact lenses and (more importantly) the leading manufacturer of Toric lenses. Headquartered in California, the company owns manufacturing plants in different countries and continents including Australia. Permeable Material: Biofinity lenses are manufactured out of a unique silicone hydrogel material known as Comfilcon A. Among its many benefits, Comfilcon A is permeable and allows a large percentage of the available oxygen to get to the eye. This reduces the level of discomfort that a person may feel as well as the odds of protein deposits building. The natural flow of oxygen also keeps the eyes white and healthy. Moisture Retaining: To prevent dryness and irritation, the lenses are manufactured with a hydrophilic compound. This keeps the lens wet all through the day. The constant wetness prevents the abrasive action of friction, even with constant blinking. This delivers a natural experience. Easy Handling: The lenses within the pack can be removed and inserted with ease. They are carefully fitted into a sterile case that rules out the need for expensive cleaning solutions. Lenses can be easily disposed after being used. AQUAFORM: AQUAFORM is a leading technology developed by Cooper Vision. It is designed to enhance the comfort of the lens. AQUAFORM achieves this by creating hydrogen bonds with the water molecules. This increases the wetness and keeps the lens soft, even when it is worn for extended lengths. The hydrogen bonds formed by AQUAFORM also increases the lens resistance to protein deposits. The lenses within the Biofinity Toric 6 pack are ideal for people who have been diagnosed with astigmatism. It may be used as a corrective measure depending on the stage of the eye condition. Patients will need to have a valid (and current) prescription during their purchase. Individuals with light or mild astigmatism can enjoy near perfect natural vision. The stable design of the lens makes it a suitable option for people with active lifestyles that keep them constantly on the move. The lens can be worn while driving or during any other event that requires peripheral vision. Different retailers sell Biofinity Toric 6 packs at various rates. The most affordable options can however be found here. Contact Lenses Online is a credible online source for Biofinity contact lenses. Buyers are issued legitimate recipients for each purchase. These receipts can be used in securing rebates from dozens of Australian health funds. Difficulty wearing and removing the contact lenses without external assistance and no opportunity to secure these. Injury to the cornea or eyelid. Individuals who are unable to maintain the care regulation outlined by Coopervision or unable to find assistance with this may need to reconsider their option. The lenses within the BIOFINITY Toric 6 pack are not toys. Using them wrongly can lead to eye infection or injury. BIOFINITY TORIC lenses can be used to correct ocular issues such as myopia. However, in order for this to occur, patients will need to carefully follow the program prescribed by their physician. The lenses within the BIOFINITY TORIC 6 pack may be worn while sleeping, however, this should only be done under the advice of your eye care practitioner. Each pack is accompanied by 6 different contact lenses which are packed in a sterile container.